Indonesia has the largest peatland area in the tropical region, situated mainly in Sumatra, Kalimantan and Papua. Peat is an organic substance which is highly combustible in dry conditions; dried peat can burn easily and spread vertically and laterally along peat layers. In Indonesia, peat fires have often occurred in recent decades. Besides being influenced by the amount of organic content, smoldering peat fires are also effected by the drying rate, pyrolysis, and heterogeneous oxidation on the peat surfaces. In contrast to flaming combustion, which have been widely studied, smoldering peat fires remain little understood. To date, the major peat fire-related publications concern the pyrolysis and combustion stages. The contribution of the drying kinetics of peat in the peat fire phenomenon is important, as this could provide complete understanding of the peat fire process. The objective of this paper is to make an isothermal drying kinetics analysis of peat. Peat samples were taken from various locations in Indonesia with the largest peat distribution, namely South Sumatra, Central Kalimantan and Papua. An isothermal test was conducted using a Shimadzu MOC63u Moisture Balance. At certain interval times, the weight of the specimen was measured, until it reached a constant weight of less than a 0.05% change in moisture content. Isothermal analysis was conducted for each peat sample at temperatures of 60, 70, 80, 90, 100, and 110oC. The results show that the activation energies from the isothermal measurement test were 24.97, 25.08, and 30.11 kJ/mole for Papuan, South Sumatran and Central Kalimantan peat, respectively. Peatlands are ecosystems which play a very important role in maintaining the balance of carbon, water and climate. Indonesia is the tropical country with the largest peatland area, of approximately 20.6 million ha, which is mainly distributed in the three large islands of Sumatra (35%), Kalimantan (32%) and Papua (30%) (Ritung et al., 2012). Peatlands store carbon (C) in large quantities and have high water retention, which acts as a hydrological buffer for the surrounding area, even during the El Niño and La Niña phenomena (Piman et al., 2016). Usually, living wood has an affinity for moisture and holds a relatively high moisture content internally, due to soil moisture (Hossain et al., 2017). Equilibrium moisture content of the peat layer becomes difficult to maintain if forests have been cleared and converted into plantations or other uses, because these processes are usually irreversible. In the long dry season, forests and peatlands may undergo substantial evapotranspiration, which leads to droughts, subsequently resulting in a decrease in moisture content. If it has become dry, the peat that was originally hydrophilic becomes hydrophobic (water-repellent, not easily penetrated by water) (Valat et al., 1991; Murtilaksono et al., 2016; Perdana et al., 2018). In such conditions, peat is highly flammable, and when burning smoldering combustion in the peat, biomass and low-rank coal piles can continue for a long time and be difficult to extinguish (Saleh et al., 2017). Peat fire events originate from peatland conditions that have become dry, with the highest moisture content that can burn is approximately 250% (dry base) (Rein et al., 2008) or 150% (Prat-Guitart et al., 2016). The drying process takes place in two stages, namely heating and drying, and occurs through the changes in temperature, relative humidity and air flow (Kosasih et al., 2016). The drying stage begin with the release of free water from the large pores of the soil. Further heating causes the strength of the capillary contraction to increase, so that the capillary water out of the soil particles at a constant drying rate. Further dehydration results in the molecular structure of the soil becoming brittle, which will be followed by the release of hygroscopic water in the falling rate period. Chemically bound water, which is not removed in the drying process, possesses the highest binding energy (Grishin et al., 2003). With regard to the drying process, the drying kinetics of peat need to be studied to understand the drying rate, moisture content and activation energy. One study on the drying kinetics of peat by Filkov (Filkov et al., 2012) using Thermogravimetry Analysis (TGA) for micro scale and KAS (Kissinger – Akahira – Sunose) isoconventional method based on the modelling of the mass loss with Arrhenius’s Law. From those methods, the activation energy and the thermokinetic constants for the drying process of three boreal peat from two regions (Edinburgh, Scotland and Tomsk, Russia) could be obtained. (Nugroho, 2002) used tropical peat material taken from Kalimantan, Indonesia, using the differential form of the Arrhenius equation method. He found that the activation energy of the peat sample was lower than other materials such as palm fibre, and wood, which indicated that it was easier for peat to react with oxygen. Some studies relating to the drying of peat include experimental study of its thermophysical and thermokinetic characteristics. (Grishin et al., 2006) found values of activation energy of 47.376 kJ/mole, and, in an investigation of the thermal analysis and decomposition kinetics of Chinese forest peat, Chen et al. (2011) found a value of activation energy of 68.510 kJ/mole. Each type of material has a specific drying curve, which is dependent on the physical and chemical characteristics of the substance. This research aims to study the isothermal drying kinetics of tropical peat taken from the Papua, South Sumatera, and Central Kalimantan provinces of Indonesia, to determine the moisture content, drying rate and activation energy, as the initial stages of the overall process of smoldering peat fires. The experimental results are expected to provide sufficient understanding of integrating fire risk consideration and management, especially with regard to peatland fires (Nugroho, 2017). In general, an increase in drying temperature will cause the reaction rate to increase. Temperature is a measure of the average kinetic energy of a molecule; raising the temperature will increase the existing kinetic energy and break the molecular bonds when collisions occur. The minimum kinetic energy possessed by a molecule must be equal to, or greater than, the activation energy for the reaction to take place. In other words, to initiate a chemical reaction, intermolecular collisions must have a minimum total kinetic energy equal to, or greater than, the activation energy (Ea). As well as peat drying process, the minimum amount of activation energy is required, so that the evaporation process can take place and the peat becomes dry. The activation energy for the drying of Papuan, South Sumatran and Central Kalimantan peat obtained amounts of 24.97, 25.08, and 30.11 kJ/mol, respectively. 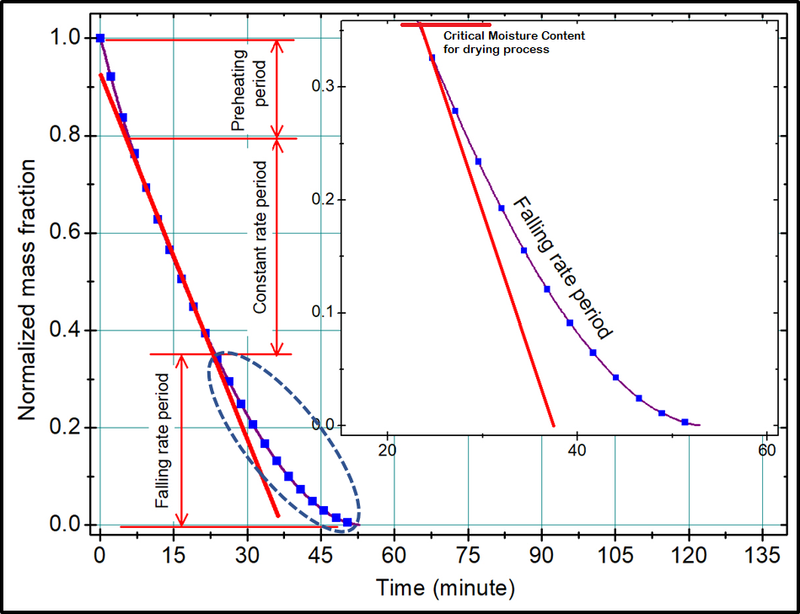 In this study, the factors which affected the drying process were temperature and moisture content. The drying temperature applied determined the reaction rate. The authors would like to thank the financial support provided by Ministry of Research, Technology and Higher Education of the Republic of Indonesia through Penelitian Terapan Unggulan Perguruan Tinggi (PTUPT) 2018 funding scheme under Grant No. 514/UN2.R3.1/HKP05.00/2018 managed by the Directorate for Research and Public Services (DRPM) Universitas Indonesia.